With a majority of adults in the United States getting their news from social media, social “shares” have become the news industry’s gold standard for measuring a story’s success – or at least an article’s virality. Like so many news organizations, local television news stations feel the pressure to air and publish stories they think will do well with their audiences. Social media can be an important piece of their strategy, informing their on-air broadcast strategy and allowing stations to extend their reach to audiences. As part of Northeastern’s Reinventing Local TV News Project, we wanted to know which stories perform well on social media for local television stations. There is a long-running debate in media studies over the extent to which television features “hard news” – public affairs – versus soft news, or lighter human interest content. In the past, there have been a variety of efforts to increase the hard news focus of stations, an issue that is a focus of our research. However, little analysis to date has focused on stations’ digital strategies. Below are some preliminary results. This May, Northeastern gained access to an API run by NewsWhip, a company that tracks the spread of articles across social media platforms like Facebook, Twitter, and LinkedIn. After putting together a list of local television broadcasters from across the U.S., we pulled the top 200 best-performing articles over a six-month period between November 30, 2016 and May 30, 2017 for each station and dumped all that data into a spreadsheet. As far as the content of the articles, NewsWhip’s API only provided us headlines, excerpts, keywords, and URLs. 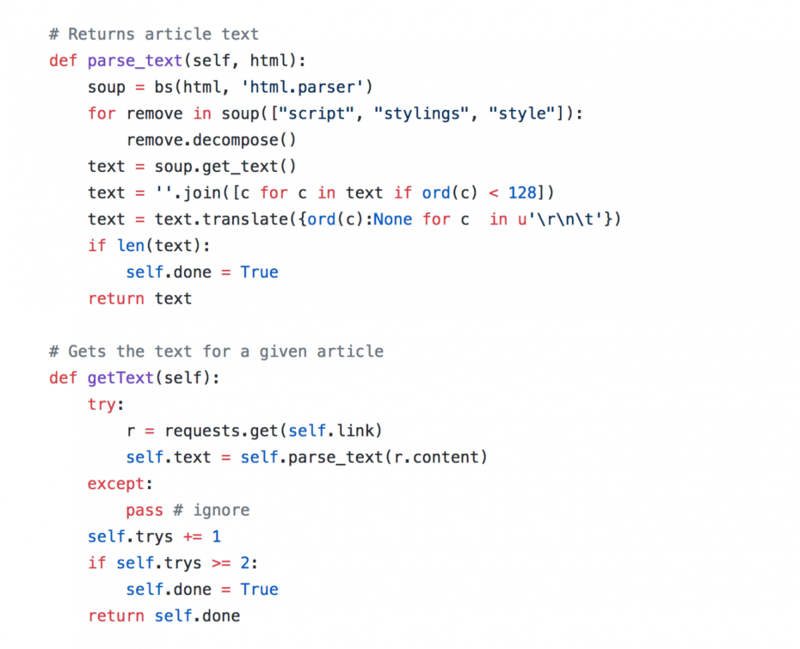 So to get the actual article text, we wrote a script using beautifulsoup, a Python library for pulling text out of HTML web pages. The script hit each article link and extract the text for each story. We turned the script into a tool, which you can access here. 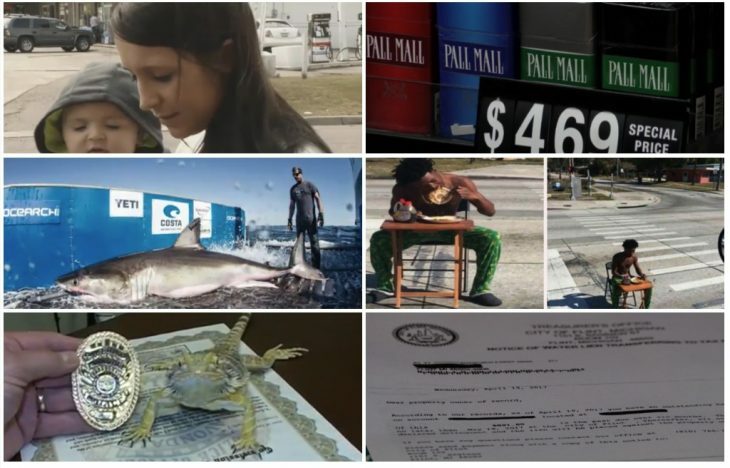 In our set of roughly 120,000 local news stories – from more than 900 stations across the country – published over a recent six-month period, the top 15 stories by Facebook shares are below. The top three local TV stories were about a $2 cigarette tax, a 12-foot great white shark, and a stolen vehicle with children in it. For the same sample, the 15 stories with the most Twitter shares can be found below. Judging by our dataset – and perhaps unsurprisingly – entertainment and human interest stories at local television news stations seem to be driving the majority of shares on Facebook and Twitter. Inspired by a study from Buzzsumo of popular headlines on Facebook, we looked at the phrases most commonly used in headlines from local television news stories published between November 30, 2016 and May 30, 2017. The graph below shows the 30 most frequently used phrases, the top five of which are police, teen, family, trump and update. Our cursory headline analysis suggests that local television news stations appear to be covering police more than anything other topic. But while the word “police” appears frequently in our dataset, those stories don’t necessarily garner the most shares on social media. The graph below shows the top 30 phrases which appeared in at least two headlines and produced the most Facebook shares. Stories about shark sightings near Myrtle Beach, also unsurprisingly, are extremely popular on social media. This analysis is still in its early stages. One route we are exploring is finding out if there is a relationship between an article’s content and how well it does on Facebook. Given a topic, then, we might be able to predict the article’s performance on Facebook. By using scikit-learn, a machine learning Python package, we are currently training a model with local television news articles and their Facebook shares so that we can eventually feed our model a new article and forecast how well it will do on Facebook. We’ll be sure to feed it some great white shark stories. Adam Wiles studies computer science at Northeastern. John Wihbey, Mike Beaudet and Aleszu Bajak teach in the School of Journalism.